The majestic red dome of Uluru (Ayers Rock) and the many smaller domes of Kata Tjuta (The Olgas) have stood for thousands of years. You really need at least two days to appreciate the countless Dreamtime stories and the many colors and endless views of this special place - from the caves and rock paintings at the base of Uluru, to the Mutitjulu Waterhole and the 36 rocky domes of the Olgas. 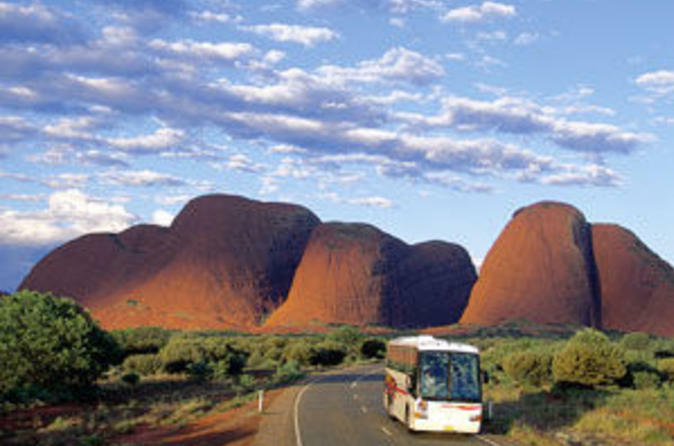 This two-day independent coach tour includes meet and greet at Ayers Rock Airport with a transfer to your hotel, the highlights of Uluru (Ayers Rock) and an overnight stay at Ayers Rock Resort in your choice of accommodation. Experience the majesty of this monolith and the neighboring Kata Tjuta (Olgas), before traveling by luxury coach to Alice Springs.